The County Class cruisers were the first post WW1 cruiser construction for the Royal Navy. Their design was to fall within the 10,000 ton limit and 8 inch gun calibre main armament of the Washington Naval Conference of 1922. Thirteen ships in three separate classes, Kent, London and Norfolk were designed and built. Orders for two other ships deferred from the 27-28, 28-29 programmes, Northumberland, and Surrey were never placed. Cornwall and Dorsetshire were both sunk by Japanese aircraft south of Ceylon ( now Shri Lanka ) on April 5 th. 1942, Canberra was sunk by a Japanese cruiser force at the Battle of Savo Island on August 9th. 1942. All of the other 10 cruisers survived WW2. The County Class cruisers were truly wonderful ships, and gave great service in the oceans of the world over WW2. Their long range made them ideal for ocean escorts of convoys, they were used to search out and destroy German Armed Merchant Raiders. Their eight inch guns hurling a 256 pound shell, as opposed to a 112 pound one in the light cruisers, put them in high demand as bombardment ships pounding enemy held strongholds prior to our invading troops storming ashore. Winston Churchill organised HMAS Shropshire to be given to the Royal Australian Navy as a gift, to replace HMAS Canberra lost at Savo Island. Served in all the RAN County Class Cruisers. I was priviliged to serve in all three of these cruisers in the RAN, Australia, Canberra and Shropshire, and to see action in all of them. The County Class were very distinguishable by their three tall funnels which found HMAS Australia the target for Japanese Kamikaze pilots at both the Leyte and Lingayen Gulf landings. At the former she became the first victim of these Devine Wind attacks struck by one aircraft, at Lingayen in January 1945, she suffered five further attacks to be put out of action for the remainder of WW2. These ships all had eight boilers, and used two to drive each shaft and propeller, they developed 80,000 horse power, all of which was harnessed to produce a maximum speed of 33 knots. Many carried a Walrus aircraft on a catapult, used for reconnaisance and spotting the main armament fall of shot. 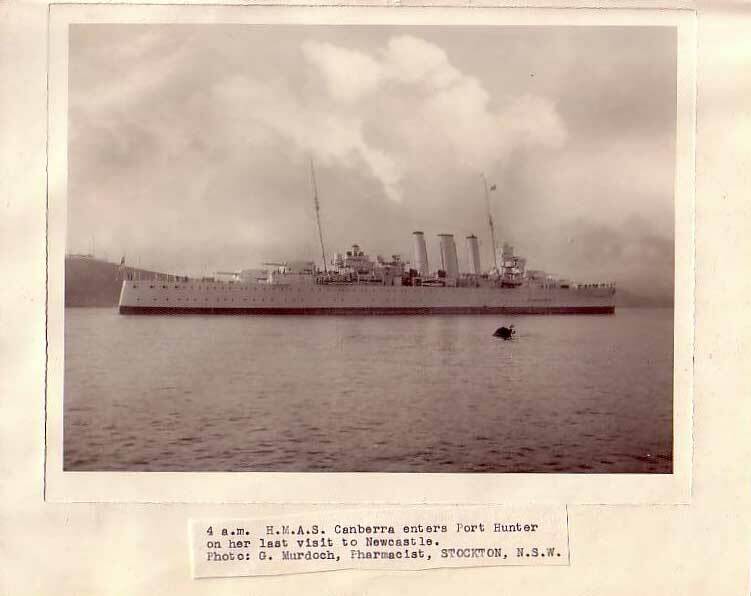 We salute the sterling service of all 13 County Class Cruisers in WW2, and out of my time at sea or overseas for all of WW2, I spent 4 and a half years in this class of heavy cruiser, and I remember them with affection, they brought me home safely, and at last it was all over. I was present in HMAS Shropshire in Tokyo Bay for the Japanese Surrender on Sunday September 2nd, 1945. A truly wonderful day!